The White House, my favorite abandoned house and most frequent photographic subject, was torn down sometime last month. 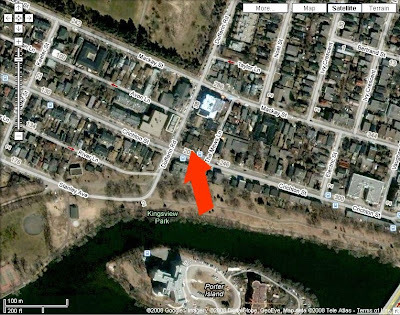 “Rideau Fire”, the hulking brick house on First Line has gone to make way for yet another housing development. Monster homes for people who want “the country life” living cheek-by-jowl with their neighbours. In May, 2005, I was lucky enough to have gone out to take photos of the old Pappas summer resort cottages. They were torn down 5 days later. Here is a link I meant to pass along when I posted the first time about the painted wall ads. It is called the Fading Ad Blog. Check it out! It is part of the Fading Ad Campaign. Check it out, as well. In researching some of the painted wall advertisements, here in Ottawa, I came across one I hadn’t seen before. It was apparently revealed when the flagship Tommy and Lefevbre burned down, earlier this year. It was fragmented from earlier demolitions, it seems, and so only parts of the original painting was visible. What was visible was very well preserved. Today, I headed down to the spot to take my own photos of the wall. It was gone. MikeyG. who posts his amazing photos on Flickr had taken possibly the only photos of the piece which is now lost to history. He very graciously sent me a copy so I could post it, here. Unfortunately, I have so far been unable to find the names of the businesses advertised. The horizontal one appears to be for auction rooms. There were a number in Ottawa, though I couldn’t find any mention of one on Bank Street. The “auto accessories”, likewise, I was unable to come up with a corresponding business. If I am not mistaken, there is a building around the corner on Flora or Arlington which was a fairly big auto repair business dating back to the 1920s. I wonder if they are related? 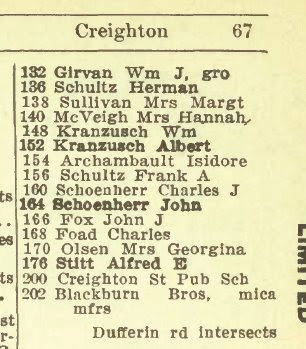 I looked through the city directories between 1901 and 1923, available online, and while the 1923 directory is the first to list the address, it is noted as “vacant”. I may have to go to the library and see if they have the directories for the next few years. My thanks to MikeyG. for allowing me to include his photo. This one was a smash and grab as I was illegally parked in a dodgy spot, left the car running while I dashed to the corner, and the parking authority guy was writing a ticket on someone a few feet away. But I managed to get the photos I wanted and not get a ticket or the car stolen! In case you are interested, the theatre was showing “Forty Naughty Girls” with Zazu Pitts (1937) and “Men Are not Gods” with Miriam Hopkins, Gertrude Lawrence, Sebastian Shaw, and Rex Harrison (1936). As run down as Barrymore’s is, I am thankful that because it was purchased and the facade kept more or less intact, we still have one existing old theatre in Ottawa. One of the great tragedies is that the wonderful Capital Theatre which opened in 1930. with 2580-seats and was originally and Loews theater. It was the largest movie theater ever built in Ottawa. It was torn down in the 1970 and replaced with a forgettable office tower and a cineplex, now gone, as well. For more on classic theatres, check the Cinema Treasures website (it appears to be down at the moment. I hope this is temporary!). I like the juxtaposition of the 100+ year old sign and the satellite dishes! This wall was revealed when a neighbouring building was torn down. For many years it was only visible from an alley between the two buildings. That’s why I never saw it before. As I mentioned in my first posting on this blog, the year we moved into New Edinburgh (1966), located on the NE corner of Crichton and Dufferin, was the former Blackburn Bros. mica factory. I am not sure when it closed. 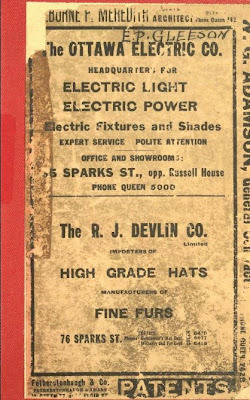 I doubt it was still in operation at that point and shortly afterwards, the building was demolished. The lot remained vacant for a good many years until a condominium building was built there. For a good many years, however, you would find chunks of mica lying about, between lumps of dog poo and broken bottles. While New Edinburgh is now a quiet residential neighbourhood, it was once a thriving industrial and business area, as well as the home of those working in the area. 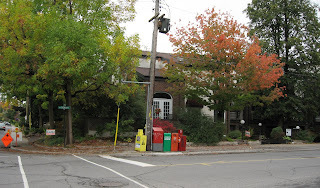 Rocklciffe Village, to the north, which is now the home of mansions and embassies was once the home of those who were in service to the rich who lived in Sandy Hill and other areas of the city, as well as government and clerical workers. Along the Rideau River which flows just two blocks away, from Crichton Street were heavy industry, chemical manufacturers, sawmills and other water-powered mills (located both at the Rideau Falls, where the Rideau plunges into the Ottawa River, but further upstream where Cummings Bridge crosses the Rideau at Montreal Road), rail-yards for both train and streetcars, foundries, amongst others. The Blackburn Brothers apparently also a mica mine in Hull Township. I am wondering if this is the one, now abandoned, located near Chelsea, Quebec. My mother used to take us up there on field trips, as well as her high school geography students and several generations of kids from our Sunday school. Mica was a very important mineral and was used in a wide variety of processes including as an insulator in high voltage electrical eq uipment, manufacturing capacitors for radio frequency applications, used instead of glass in windows for stoves and kerosene heaters (and in greenhouses), pressed into a thin film and used on Geiger-Müller tubes to detect low penetrating Alpha particles, in cosmetics, used in the creation of “interference paints”, used in heating elements, as a substrate for sample preparation for the atomic force microscope, and as clean imaging substrates in atomic force microscopy…. It has been used since prehistoric times (as a pigment for cave paintings) and in windows before the it was discovered how to create glass in sheets. At the Pyramid of the Sun at Teotihuacan, near Mexico City, contained considerable amounts of locally mined mica in layers up to 12 inches thick. It continues to be used by the Hindus during Holi, in the pigments thrown during the festivities.